It required a pedestrian mechanical malfunction for me to learn about the outer limits of humanity’s skill at closing hand grippers — which most people know only in their cheap Wal-Mart variant. To be more specific, I was driving my 1993 Honda Accord during a brutal Texas heatwave four summers ago when the air conditioning system gave out. 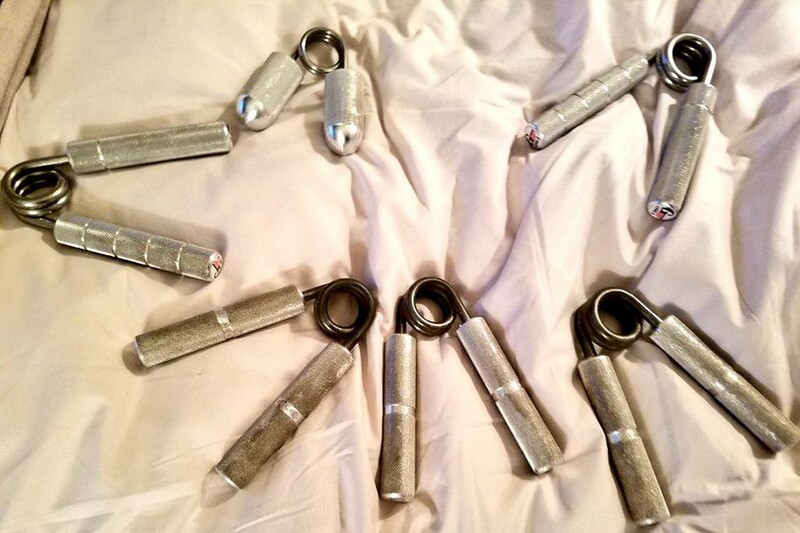 A “grip guy” — i.e., someone who lifts fat bars, crushes nails, shatters almonds, finger-walks sledgehammers up and down his hands, and most importantly, manages to achieve certified closes of Captains of Crush grippers labelled “3” (280 pounds of pressure), “3.5” (322.5 pounds) and “4” (365 pounds, a feat accomplished by only five people ever). For Pankoff, mashing together the two handles of a heavy-duty gripper — which is how you train the crush grip — is the ideal exercise, one that taxes both heart and soul. To drive those handles together until the device clicked was to achieve a greater understanding of your limits, as you sought to transcend them. In Pankoff’s opinion, achieving a “certified close” of a Captains of Crush gripper, as verified by Iron Mind personnel following Iron Man certification standards, is a way of writing your name into the pages of eternity. In the hopes of seeing if I possessed any promise as a grip specialist, I entered two grip-specific competitions — the first in 2015, two years after my fateful trip to Pep Boys to get my air conditioning fixed, and the second in 2016. The Metroflex was always hosting or promoting such competitions, so sign-up was easy and attendance often ran into the hundreds of people, dozens of whom were also participating. However, neither of these events featured challenges involving heavy-duty grippers. Instead, competitors toted around heavy dumbbells with fat grips during a “farmer’s walk,” took turns picking up barbell plates with a pinched grip, held car batteries suspended in front of their faces and deadlifted using only four fingers on each hand. My performances were fine — middle-of-the-pack placements in the 198-to-220-pound weight class, with no “did not finish” marks sullying my record — but also nothing to write home about. So why use these heavy-duty grippers at all? They aren’t the best training device for other sports — even seemingly related grip sports. On top of that, it’s about as lonely an activity as one can imagine. The heavy-duty gripper community exists almost exclusively on the GripBoard forums and in YouTube and Vimeo videos and comments.